Minister Alex White boldly announced that “It is ‘Our Energy Policy Paper’ because Energy Policy is first and foremost about people…”. One could imagine that for there to be a proper consultation exercise to properly consider these submissions, there would be a host of seminars in different centres around the country and, at the very least, that there would be 1,200 invitations sent out inviting those citizens who were interested enough to make a submission to attend a seminar in their area. Not so. There will be one seminar at the Gibson Hotel at 2.00 pm on Tuesday 21st October. According to the invitation from the DCENR it will be “a workshop to consider the Priority 3 issues in the Green Paper and the submissions received during the public consultation period”. Unless that ‘workshop’ is scheduled to last for three days commencing at 2.00 p.m., how on earth will it manage to discuss Priority 3 issues and 1,200 submissions? The DCENR has an answer to that: Not all submissions are equal. If you lodged a document that is the same or similar to another submission lodged, your submission is termed “a petition” rather than a submission. I know this because my friend Nigel de Haas of West Cork Wind (www.westcorkwind.com) compiled and submitted an excellent and very comprehensive submission on the Green Paper which must have required a great deal of research and effort to compile. Nigel very generously made this document available on his website so that others could use it as a template with any modifications they might desire. When Nigel contacted the DCENR to enquire why he had not received an invitation to the Priority 2 workshop as he had made a submission, it was clear that his document was being treated as a petition rather than a submission and accordingly he was not on the invitation list. This was despite the fact that his submission can be found on the DCENR’s website with the other submissions. It gets better. The invitation to the 2.00 p.m. workshop proudly announces that “It is scheduled for that time and place in order to partner with a seminar entitled “Planning for Energy Infrastructure”, which is being organised by EOLAS magazine in the Gibson Hotel on the morning of 21st October, in the expectation that this partnership will facilitate the target audiences for both events.” (my bold). (Details of the seminar can be found at http://www.eolasmagazine.ie). Clearly the DCENR regard the EOLAS seminar as an integral component of the purported consultation process, as it is partnered with the DCENR afternoon workshop and is taking place in the same venue. The morning seminar is scheduled for four hours whilst I would be surprised if the 2.00 p.m. ‘workshop’ is allowed to run after 4.00 p.m. as everybody knows that is the time that all civil servants turn back into pumpkins. ● Hacks, pacts and turbines: Using the Irish press to understand the social acceptance of wind energy”. (This is my favourite, with phrases like ‘understand the social acceptance’ it sounds like somebody has been reading Joseph Goebbels again: “The bigger the lie and the more often it is repeated, the more people would believe it, even if no evidence could be produced.”(1933)). So what is the problem, you ask? Surely it’s a whole-day event where the concerned citizen who made a submission can go to the EOLAS event in the morning, challenge the speakers, and then workshop those ideas in the afternoon? Two hours is not a reasonable time-frame to discuss the energy policy for the entire country and the four hours of the morning session cannot be added to that time-frame. It is not a ‘public meeting’ as the cost effectively excludes the majority of citizens. It is a commercial venture pandering to the energy industry and bears an uncanny resemblance to that tent at the Galway Races. Article 7 of the Aarhus Convention requires that each party shall make appropriate provision for the public to participate during the preparation of plans and programmes relating to the environment, within a transparent and fair framework, having provided the necessary information to the public. As we are in the period between the Green and White Papers, it means we are still at the initial stages of the consultative process, when all options should still be open, and decision makers should be prepared to be swayed from their opening positions. However, when one reads the language used by the Minister at the initial ‘consultation’ with “stakeholders” , and, with regard to the proceedings on 21 October, one notes the manipulation of the invitations, the truncated time-frames, the topics on the table, the identity of the speakers at the EOLAS shindig, and the affiliations of the members of the ‘Steering Group’ to advise on the White Paper, it is clear that the DCENR have no inclination of wavering from their current wind-dominated policies. This is a black-tie rubber-stamp affair, not a public consultation. The Aarhus Convention makes it clear that the days of governments telling their citizens to “shut up and listen” are over, at least as regards issues of the environment. Despite being told this in no uncertain manner at the recent local elections, this message has not penetrated the collective psyche of this government of ours. Their arrogance and condescending attitude seems to have increased, not decreased, as they have established themselves in power. This latest instalment of executive skulduggery is proof of that. 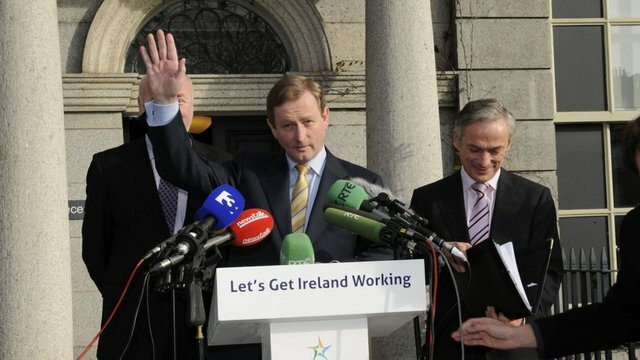 This entry was posted in Uncategorized and tagged Aarhus Treaty; Aarhus Convention; UN; EU; windfarms; NREAP; Pat Swords; Rabbitte; environment; wind turbines; consultation; EirGrid;, EirGrid; budget; tax; stealth tax; PSO Levy; electricity price; charges; financial statement; Fine Gael; Fianna Fail; Labour Party; People Before Profit; Direct Democracy; ESB; Rabbitte; Phil Hogan; S, Energy and Natural Resources; DCENR, Green Paper on Energy; Eolas magazine; public consultation; Alex White; Department of Communications. Bookmark the permalink. 8 Responses to Public? What public? Well said Neil and Nigel, the more people that highlight how unacceptable this behaviour is the better, not least as it leads to corruption. On the 21st September 2011, I appeared before the UNECE Aarhus Convention Compliance Committee in Geneva, going essentially ‘head to head’ with the EU over the renewable programme in Ireland. The written phase on Communication ACCC/C/2010/54 had already taken place and as is their procedure, the Compliance Committee called both sides to a hearing to investigate further. After that meeting, I prepared a written account, which finishes with the below. In my closing statement to the Committee as the Communicant, I then pointed out that the Convention applies to Community Legal Order in Ireland. Yet we have major breaches, particularly with regard to the renewable energy programme, in relation to Articles 4, 5, 6, 7 and 9. Indeed with regard to the renewable energy programme, not only is there no Strategic Environmental Assessment, but the environmental objectives, costs, benefits, impacts, alternatives are all unknown. So how could there be compliance with Article 7? Furthermore the EU had clearly failed with regard to Article 3 to monitor the Convention and ensure proper enforcement. Yet the most important issue was how so many technical resources, who had so much to contribute to these issues, were being deliberately shut out of the decision-making. This is why the availability of Communications to the Compliance Committee was so important. Indeed, the EU had clearly demonstrated outright hostility to myself and had publicly treated me in derogatory manner. Few people would have had the technical expertise and determination to take this case to the point, which I had, and their approach was definitely to deter other people from coming forward and instead maintain them as ‘silent others’. This was not in the interest of proper democracy and was completely against the principles of public participation, which was to be inclusive and bring out the talents and skills of others. •	Mr Swords is of course entitled to his opinion and to air it. However, it is a view which has no value; he is clearly wasting his time and would be better off spending it on something else. That does not surprise me at all, Pat. The DG Energy is completely wind dominated, to the extent of having massive posters of windfarms on their walls. The whole place has been infiltated and corrupted. Very informative thanks. The “social acceptance” thing is scary, like something from Stalinist Russia or 1984. It is indeed curious that the DCENR appears to be limiting public consultation on Priority 3 to an hour and a half and will not be providing an agenda in advance. Priority 3 of the Green Paper addresses Planning and Implementation. Paragraph 4 of Section 3.5 recognises that “A new way is required, one that places the citizen at the heart of the planning and decision-making process, and ensures that public and private actors effectively communicate the risks and benefits associated with energy projects in both a local and national context”. The section goes on to endorse the report from the NESC entitled “Wind Energy in Ireland: The Challenges of Community Engagement and Social Support” as being of interest to citizens and stakeholders who wish to make submissions in relation to community engagement. There are seven questions to be discussed during the 90 minutes provided. Questions 17 and 18 are particularly poignant. 18. What additional improvements could be made to the permitting and licensing processes for energy infrastructure projects to make them clearer and more efficient for project developers, the public, and other stakeholders? You’re quite right Nigel. We’ve all heard of box-ticking exercises but this takes the biscuit! The recent rolling out of the newly established ‘Public Participation Network’ (PPN) is another style of bullying and coercion put in place by this government. Word is coming back that people/groups were actually turned away from the last meeting in Waterford, they were told that they didn’t meet the strict criteria set out by the (self appointed) Environmental Pillar to allow for engagement via the so called participatory network. The newly appointed environmental ‘secretariat’ for County Waterford, is a council employee and was ‘voted’ in under very unusual and irregular circumstances. It is our concern that this PPN will be used in an effort to ‘prove’ compliance with Aarhus, when the facts, as witnessed by many, are that this is an attempt to ‘power grab’ at local levels and remove any bodies or groups that would question how policies are being made, especially in relation to energy and environmental considerations. In fact this PPN can be used to override all concerns and write reports that claim to represent people’s views. There is no monitoring, no interaction and no consideration from local council employees towards their own neighbours. If this can be carried off at a local level. where people live in close quarters with each other, then why not on a National level? Decision making has been placed ‘just outside’ ordinary people’s reach, we can see what’s happening but are powerless to stop it until we all come together and demand change. On the upside it is fantastic to see people engage and take a real interest in our energy needs. The campaign to rethink our energy has drawn people from all walks of life into a forum that is uniting and educating itself. People are waking up and joining the dots, the picture that is emerging is one of greed, corruption, arrogance and a complete lack of interest in future generations. Thanks, once again, for your work Neil. It’s very much appreciated. Thank you for your comments. I share your concerns about the PPN – there is a bad smell coming from that body. It was effectively Phil Hogan’s swansong before he went off to the EU. Once we start getting some first hand reports from people who have tried to engage but were excluded, it will be worth a blog and probably a report to the Aarhus Compliance Committee. It never ceases to amaze me just how stupid this government must think we are. Alternatively they are so stupid that they think they can get away with it.